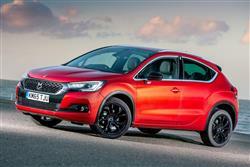 Citroen's upmarket DS brand is boldly going places. The experts at Car & Driving take a look at the DS 4 Crossback to discover if it has a better chance of reaching those places. The DS 4 now comes in Crossover-orientated 'Crossback' guise, in which form this premium hatchback offers a higher view and greater versatility. A simple, high quality interior with innovative design and technology ensures the cabin will be a pleasant environment but, with limited rear space, the most comfortable back seat passengers will be children. Citroen tore up the rule book of luxury automotive style when it introduced the first DS model back in 1955. Named for the French word for 'Goddess' (Deesse), this ground-breaking model managed to be serene, bizarre, elegant and ugly all at the same time and set the tone for Citroen's unique take on car design. After being out of use for 35 years, the DS name reappeared in 2010 on premium Citroen models and has now been spun-off into a upmarket brand with a distinct product range. The complete line-up of DS Automobiles spans from the DS 3 supermini to a plush DS 5 model that targets prestige-badged compact executive saloons, all these premium designs commanding a higher price than equivalent models under the Citroen brand. 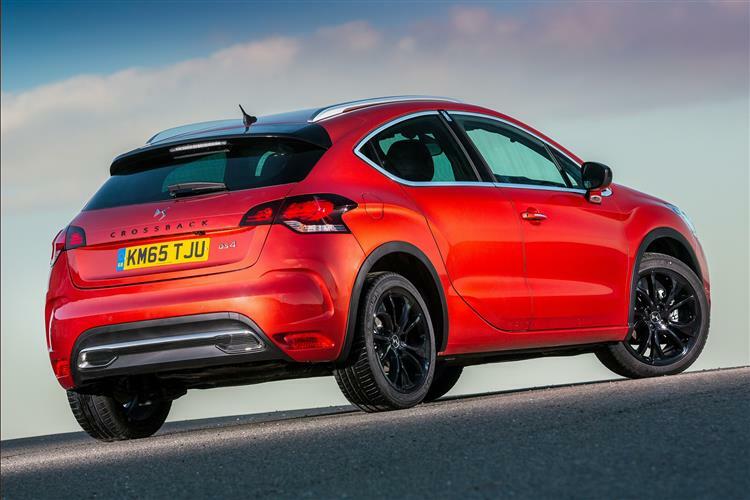 The DS 4 hatchback sits in the middle of the range, targeting cars like the Audi A3 and the BMW 1 Series and the Crossback variant aims to broaden this model's appeal towards the kind of customers who might also be looking at plusher compact Crossovers, cars like Audi's Q3 and BMW's X1. With the Crossback treatment, the DS 4 gets a bigger presence, higher ground clearance and a more rugged style, in the same all-round package. 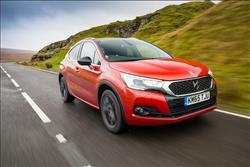 The DS 4 Crossback comes with a choice of three power units - a 130bhp petrol engine and 120bhp and 180bhp diesels. 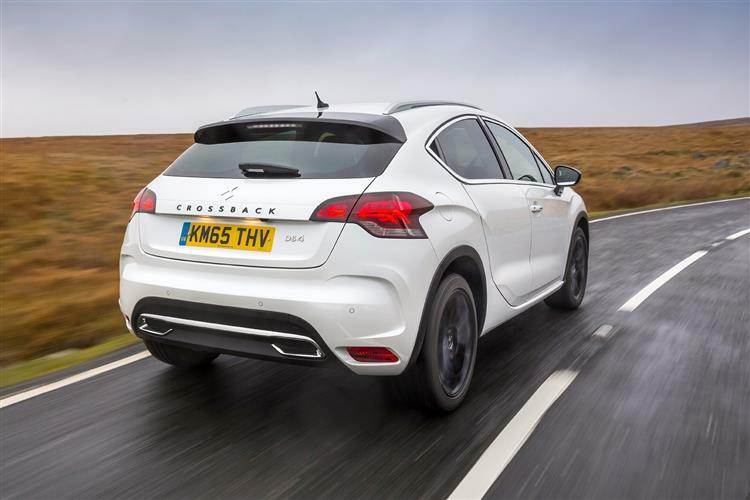 These units are certainly torquey enough for low-end rough stuff performance but in reality, it might be expected that the toughest terrain a DS 4 Crossback would ever face would be a high kerb or a bumpy driveway. Still, it looks as if it might be capable of more than that and for likely buyers, that'll be all that matters. On tarmac, the higher stance of the Crossback should give you a more elevated view of the surroundings and a greater sense of safety, but be prepared for a little more body roll in the corners compared to the standard DS 4. With the PureTech 130bhp petrol engine, the Crossback should reach 62mph in 10.1 seconds and top out around 123mph. The 180bhp BlueHDi Diesel version comes with more sporty trim to match the higher performance and price. Though this remains exclusively a front-wheel drive vehicle, Citroen's Intelligent Traction Control system is designed to keep the driven wheels gripping on more slippery surfaces. The Crossback is based on the revised DS 4 range that gets its own 'DS'-specific front grille and a slightly more premium look. Elegant LED headlights and tail-lamps reinforce the 'avant-garde' design philosophy DS has adopted, and the overall shape is neither offensive, nor extravagant, as befitting a premium high-volume hatch. This 'Crossback' variant, sets itself apart from standard versions with a 30mm increase in ride height and stronger styling features that include grey roof bars, emphasised wheelarch trims and a black rear spoiler. Inside, the interior textures and premium layout give an upmarket feel to the car and there's an innovative seat design that resembles a metal-link watch strap. It all shows the concerted effort DS Automobiles is putting into the originality of its products. Space inside is sufficient for driver and front passenger but in the rear, it is compromised by tight legroom and a low, curving roof-line. For children, the three back seats should be fine but adults may find this space restrictive. There's a premium to pay for the 'Crossback' model's crossover-style look - £1,000 over plusher 'Prestige'-trimmed versions of the standard DS 4. That means pricing n the £22,000 to £27,000 bracket. Still, you get quite a lot for that; 18-inch gloss black alloy wheels, black leather upholstery, a panoramic windscreen, aluminium roof bars, dark tinted side windows and a Navigation system. Safety features include a Lane Departure Warning system to keep drivers alert and a Blind Spot Monitor to reduce the chance of a collision when you're pulling out to overtake. 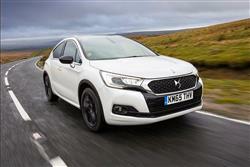 As with all DS 4 models, you'll find a whole series of unique features which the French brand hopes will hook potential buyers in the showroom. The top-flight sound system developed for this model for example, featuring what DS call 'effective soundscaping', with sound distributed evenly around the cabin. For enhanced vision in difficult conditions, the front fog lamps provide extra light to boost visibility by up to 75 degrees when the vehicle is turning. This DS4 can even think for you. Its standard 'DS Connect Box' provides a clever 'SOS & Assistance pack' will manually - or automatically - call the emergency services. There's also a 'Monitoring Pack' to give you eco driving tips and advise on future maintenance requirements, a tracking system for recovery of the car if it's stolen and even a Mapping pack that can advise you if the car leaves a given geographical area, should you lend your DS4 to someone. 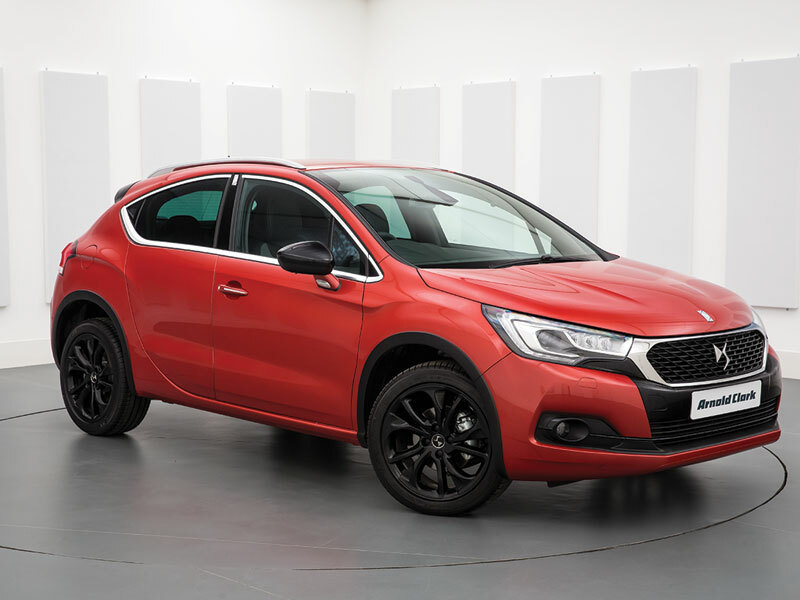 Despite the premium price tag, the DS 4 Crossback uses highly efficient engines which keep the overall cost of ownership low. The PureTech 130 three cylinder petrol engine delivers a reasonable 55.4mpg on the combined cycle, while emitting 119g/km CO2. The BlueHDi 120 diesel model can achieve a more pocket-friendly 74.3mpg, and manages to keep emissions down to 100g/km. DS models come with Citroen's three-year/ 60,000 mile warranty. 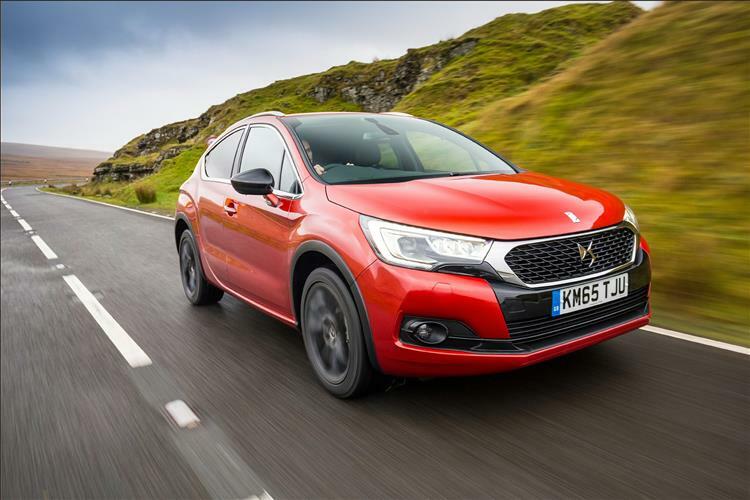 This is transferable to the new owner if you decide to sell before the three years is up, which will help keep the residual value of your DS 4 Crossback relatively high. Fixed price servicing with MOT's can be chosen from £149 or service plans can be set up from around £11 per month. To end, we'll point out that though there's no fuel or CO2 running cost penalty for choosing the Crossback bodystyle, you will pay more in insurance costs with this derivative - which seems rather unfair. In the Crossback line-up, a PureTech 130 model is group 21E, the BlueHDi 120 is group 24E and the BueHDi 180 variant is group 30E. One day, the DS brand will doubtless have a purpose-developed version of one of those family crossover models to offer us. A proper Qashqai, Kadjar or Audi Q3 competitor. For the time being though, this fledgling marque has only a limited range - yet it can't afford to ignore this fast-growing segment. 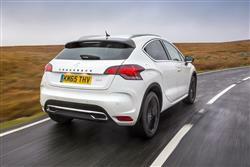 Hence this Crossback DS 4 variant. If you were looking at a premium compact hatchback and like the idea of a dash of 'SUV'-ness, it may actually be all you really want or need. No, you won't really be able to take this car off road to any significant extent - but to be frank, you wouldn't really want to do that with a 'purpose-designed' crossover like a Qashqai or a Q3 either. 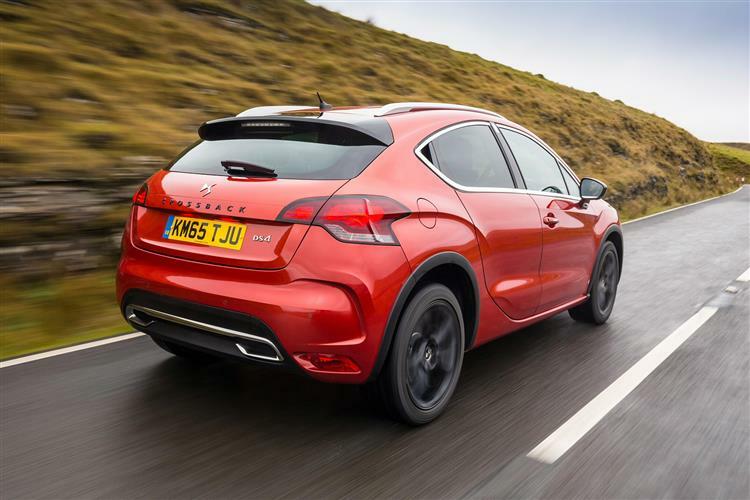 If conditions do get slippery, it is perhaps ironic that, thanks to a grip control system that cars of that kind often lack, a DS 4 Crossback would actually be more use to you. You've really got to want its go-anywhere looks to justify the price premium being asked here over a normal DS 4 but if you can, here's a quirky but quite appealing choice. To find your nearest DS branch, please enter your location.